Hello Sweet Friends! 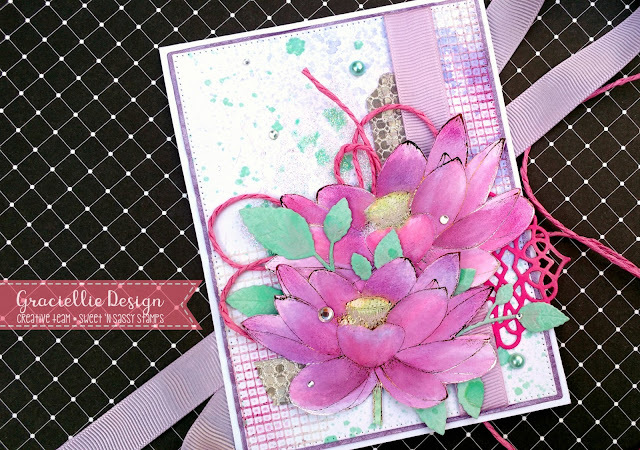 Julie here to share a Mixed Media card that I created with the new Floral Greetings stamp set. I just love this clear stamp set that was designed by Graciela Chavez, (Graciellie Design)! The flowers are absolutely gorgeous as well as the font on the sentiments- don’t you agree? 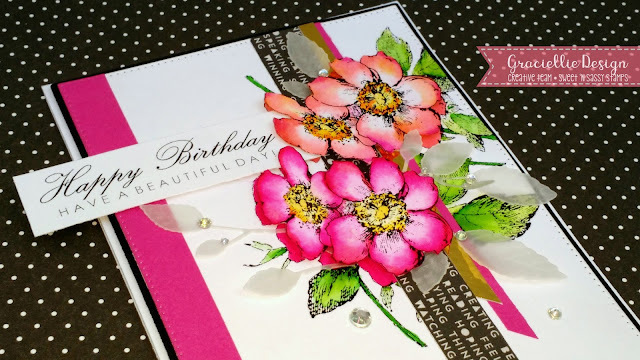 I started by heat embossing the Floral Greetings image with black embossing powder on white cardstock and used water based markers to watercolor the image. I added a few highlights to the flower centers with a white paint pen. I used a stencil with a stencil brush to lightly apply a soft pink ink to a piece of white cardstock for the background panel, stitched this panel to a piece of black cardstock with a sewing machine before layering onto white and black cardstock. A scrap piece of patterned paper was stitched in place before adding the watercolor focal image panel with dimensional foam. The sentiment from Floral Greetings was heat embossed with white embossing powder onto black cardstock and I finished off the card with the bow, button and a few pearls. Thanks again for taking the time to stop by- I hope I have inspired you today to create something fun this week! Hugs and have a blessed week, sweet friends! Hi all! Angel here today with a card that could be used for almost any occasion. 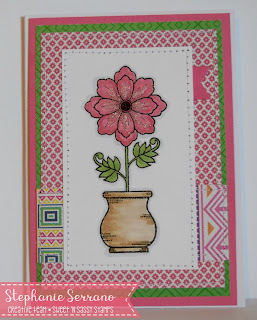 I absolutely adore the newly released Pretty Potted Florals stamp set. I colored one with Copics then cut it out. 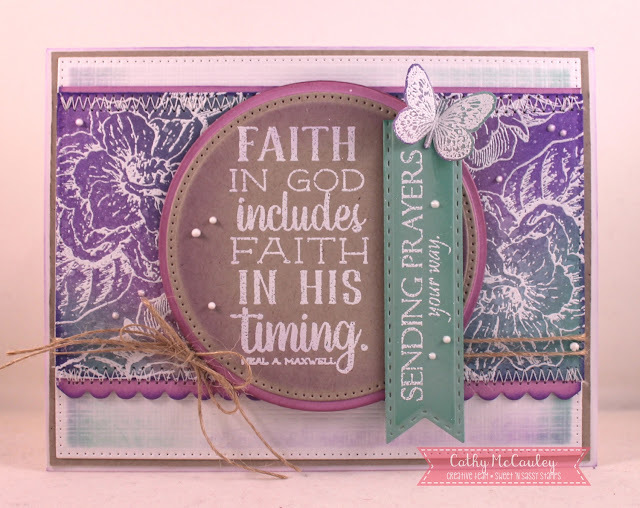 I then layered it with foam adhesive over a card stock layer that I had stamped 4 of the words from the Creative Worship: Words of Life - Actions stamp set. 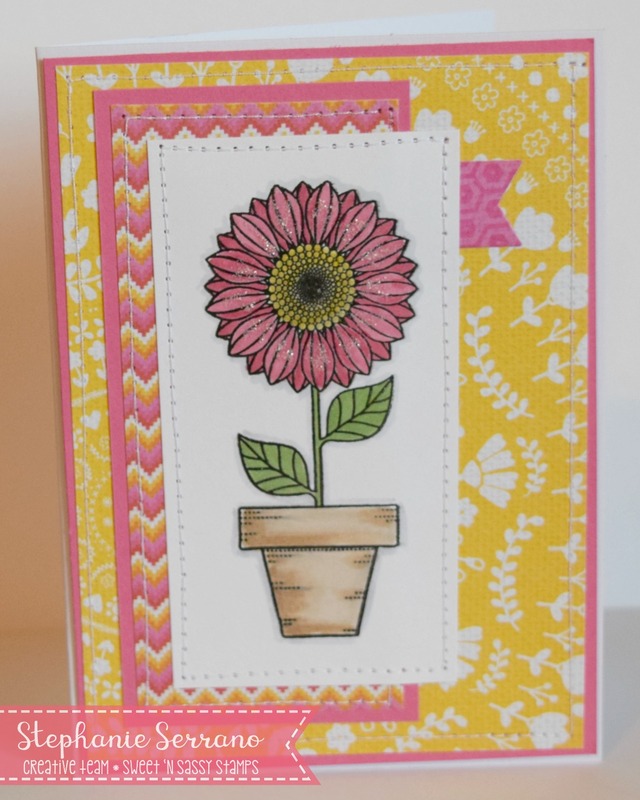 I plan to make a set of these cards using all of the images from the Pretty Potted Florals set and then changing up the words on the background layer. 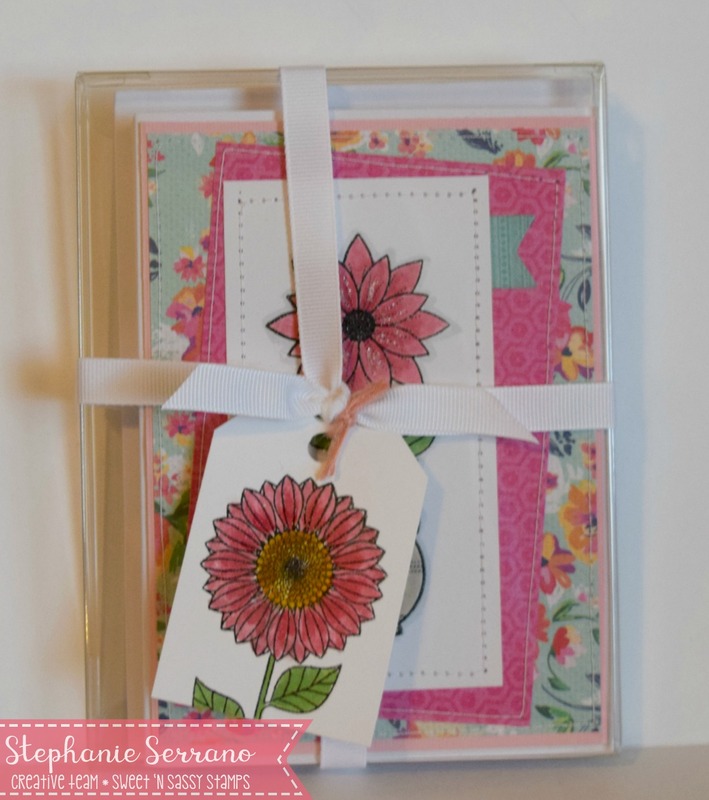 So simple and perfect for many occasions like I mentioned before :) This is a square card, by the way. 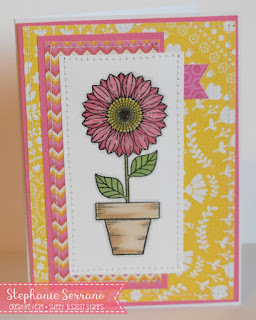 Today I am sharing a CAS card using the new Pretty Potted Florals and Floral Greetings (for my sentiment) stamp sets from this month's release. I kept this clean and simple and used up some scraps of paper. I pulled the colors from the paper to color with Copics. The flower petals and pot were stamped again, colored, and popped with foam dimensionals. Have a great Friday! 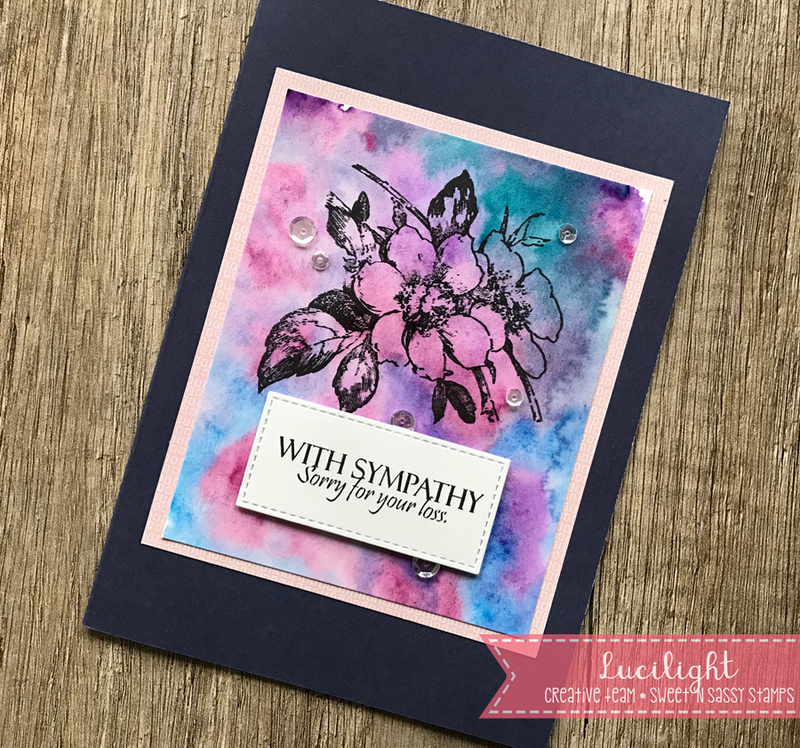 Thanks for popping in and… happy stamping! You can't miss the new stamp sets this month. 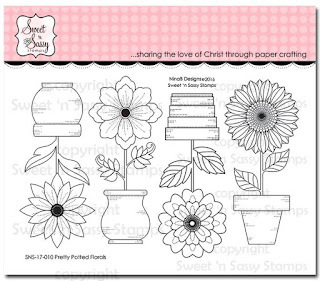 I believe we're all in love with the beautiful flower stamps that were added to the collection. They're beautiful and really versatile! 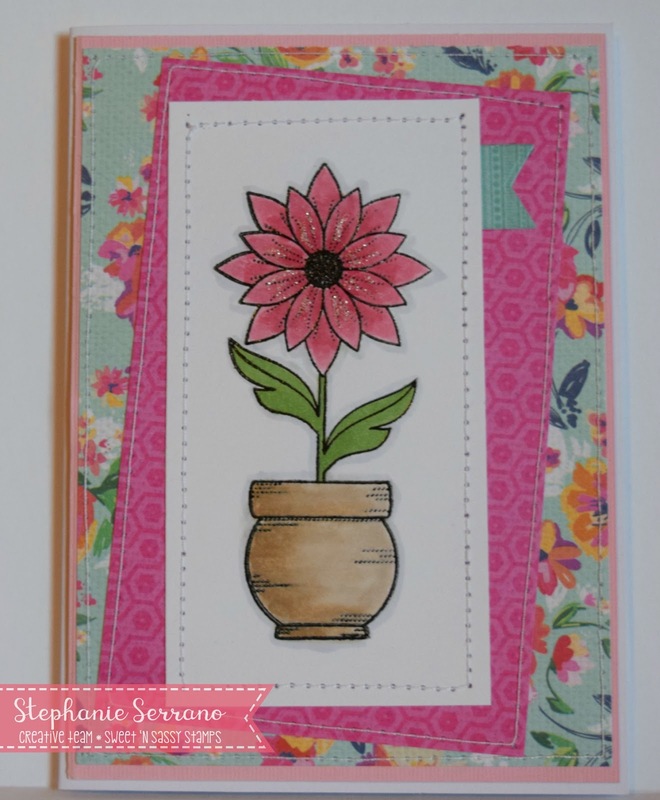 For this card I used the floral greetings stamp set. 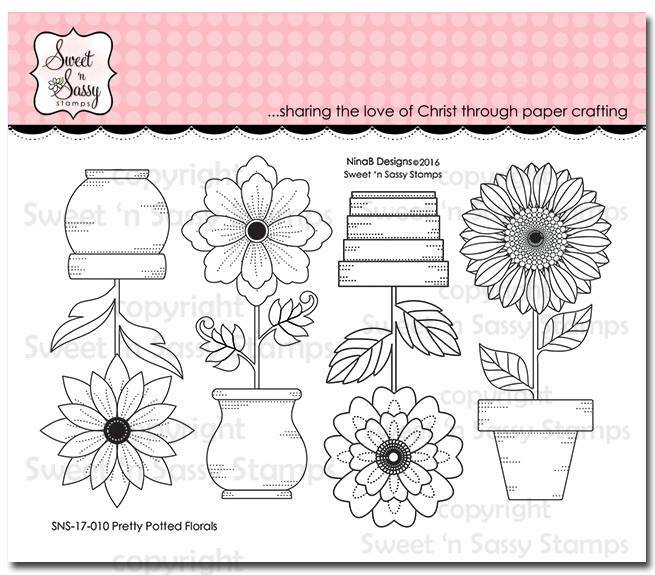 The images are so detailed and beautiful that you don't even have to color them (they're great for backgrounds too!). For this card I made a watercolor panel for the background. I just added a lot of water to my watercolor paper and dropped blue and purple paint on it. The water does the blending for you and you just have to wait until it's dry. I used the larger flower from the set and I stamped it on the background I made. I started with stamping the sentiment on the watercolor background too, but it didn't stand out that way so I decided to die-cut a piece of white paper and stamp the sentiment on it. I raised the die-cut piece a little bit with foam tape. I used dark blue card stock to match my watercolor paper and matted the watercolor piece with light pink patterned paper. This way the card didn't get too dark. I added some Wink of Stella to the flower so it has a little sparkle (hard to see on the pictures, but this last one shows it best). I added a couple of clear sequins too to finish my card. Hello SNSS friends! The weather here has been unbelievably warm with temperatures reaching seventy degrees...in February. 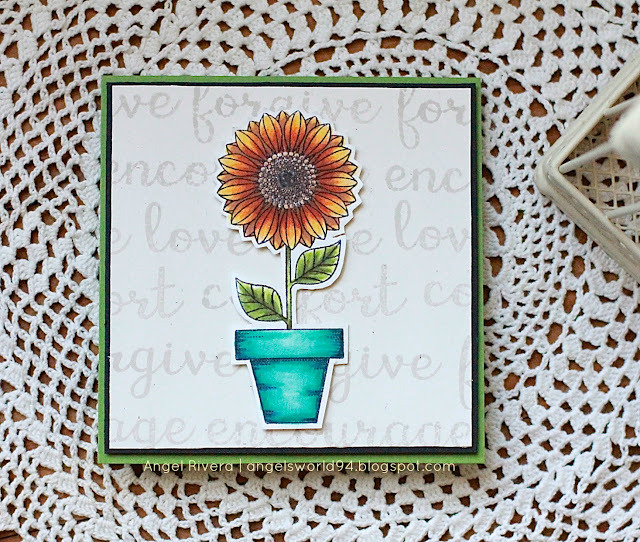 It's is still too early for flowers, but that's okay since Sweet 'n Sassy Stamps has released several new flower stamp sets to get us ready for Spring! The flowers in the Floral Greetings stamp set designed by Gracie Chavez are perfect for embossing. 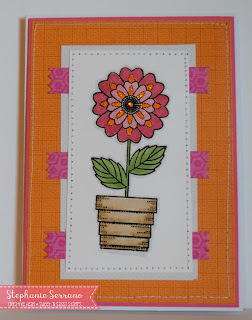 The color was sponged on Neenah card stock and the flowers white embossed. A sentiment from the Truth Quotes 1 set is the focal point on this card which was inspired by the Splitcoaststampers sketch challenge for today. 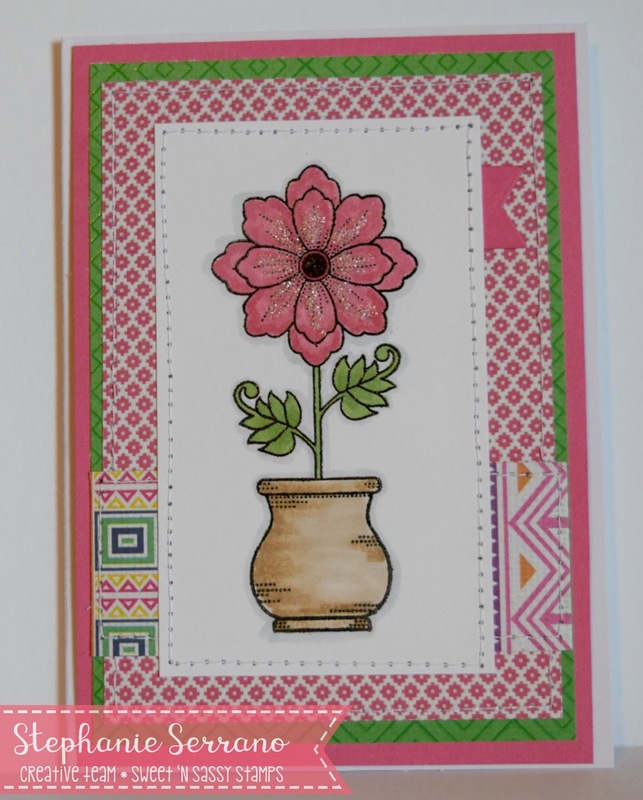 On this card the flowers were randomly embossed on the background and water colored. The main floral image was colored with Copic Markers and fussy cut. 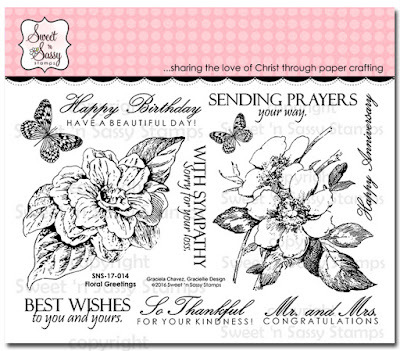 The stamp sets used to create these cards are available at the Sweet 'n Sassy Stamps Store. I am really enjoying working with this set and I know you will, too! I am so in love with this set called Pretty Potted Florals that I decided to make a set with it. I colored all the flowers with copic markers and added some stickles to them for a little shimmer. I tried to stay in the pink family as far as color goes and the papers are from all different companies. I made a little tag to put on the front of the box. This set is just so versatile and I think it is perfect for a little set! Make sure you check out the 50% off discontinued items sale going on now. You can see the items on HERE. 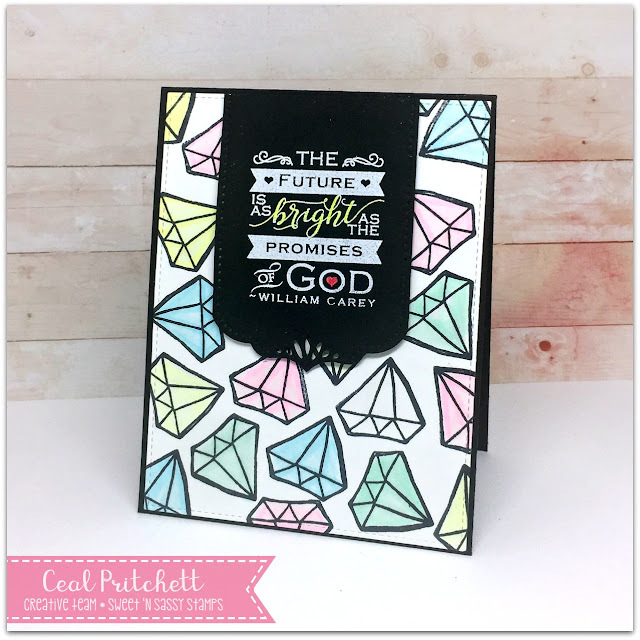 It's Ceal, here to share with you today a card using one of our new releases along with an older favorite. 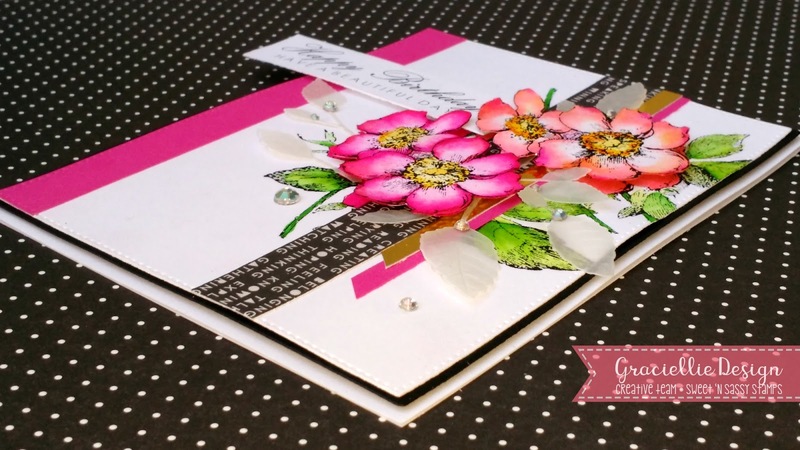 For my card I started with a black top folding card base and a white stitched panel. I made the background by randomly stamping the diamond from the new set Worthy King to cover the panel and colored them in with Copic markers. 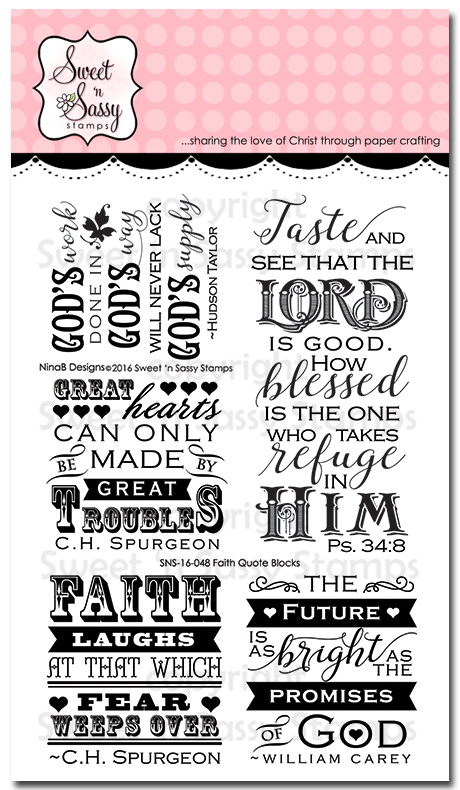 I made a focal point with one of the quotes from the set Faith Quote Blocks. 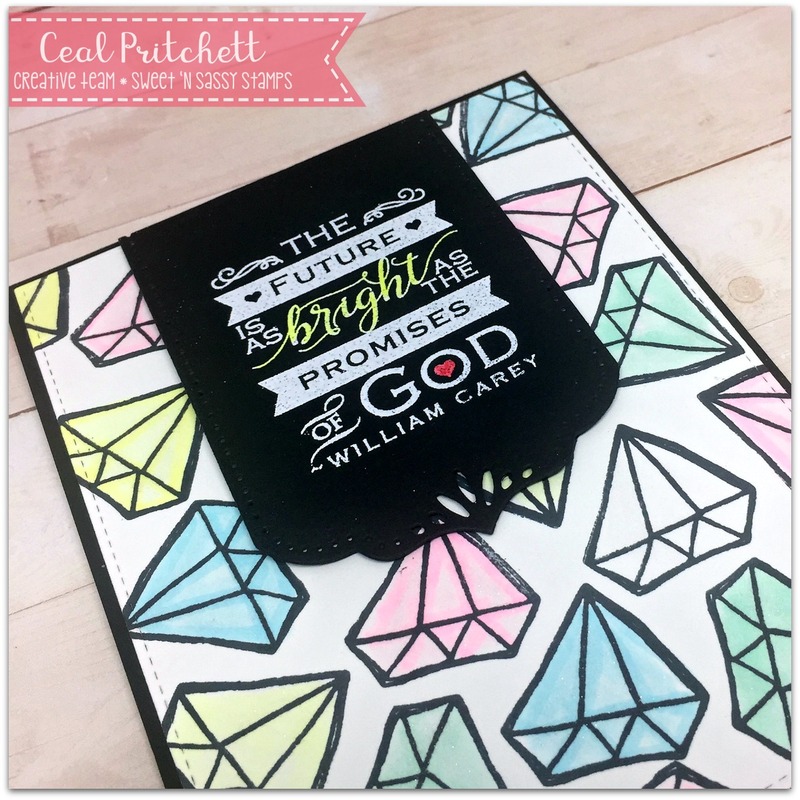 I embossed the greeting in white embossing powder and then colored the word "bright" and the heart with comic markers. 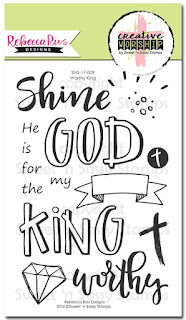 Worthy King is in the Creative Worship line, I wanted to show it can be used for a card as well. 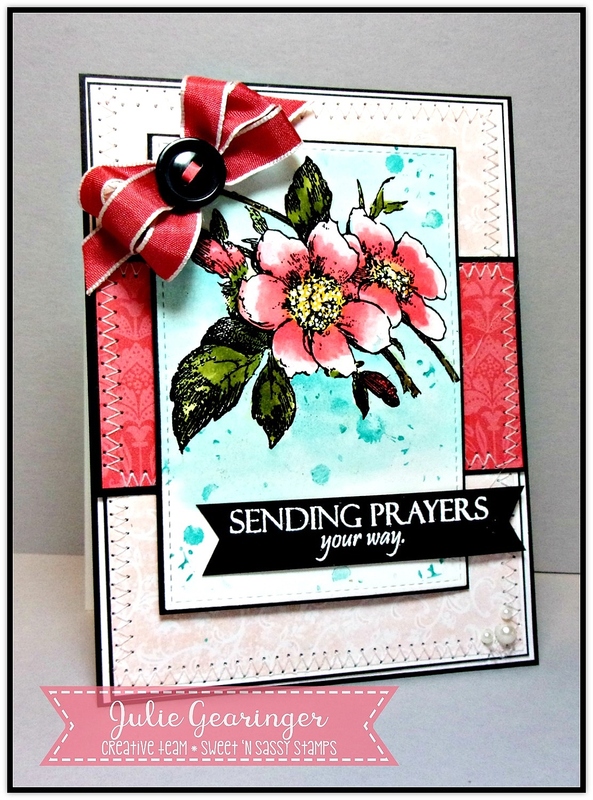 It's Gracie Chávez and today I'm here to share a new card using the new stamp set Floral Greetings. 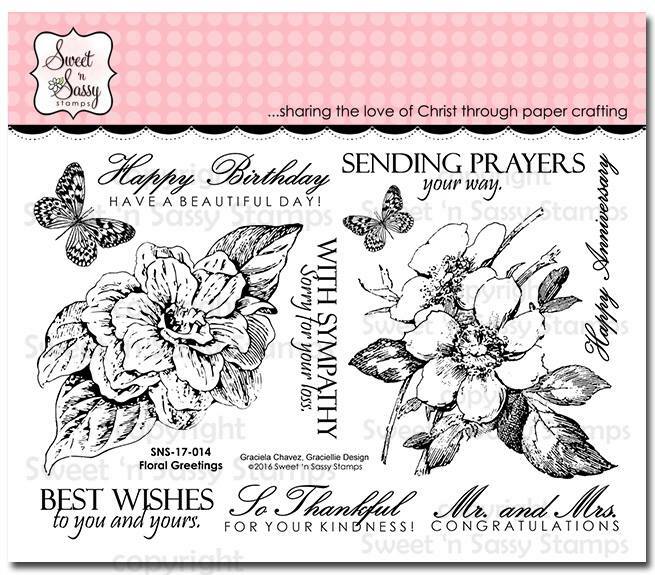 I had the absolute joy to put together this set for Sweet 'n Sassy Stamps that includes two beautiful floral images and a collection of greetings for every occasion! My card for today is very clean with a striking color palette. I wanted the flowers to stand out more than anything else. I colored them -guiding myself by dog roses pictures- in two tones of pink and decoupaged them to add more dimension. To create the decoupage effect I stamped the dogrose branch twice to the background and colored the images. 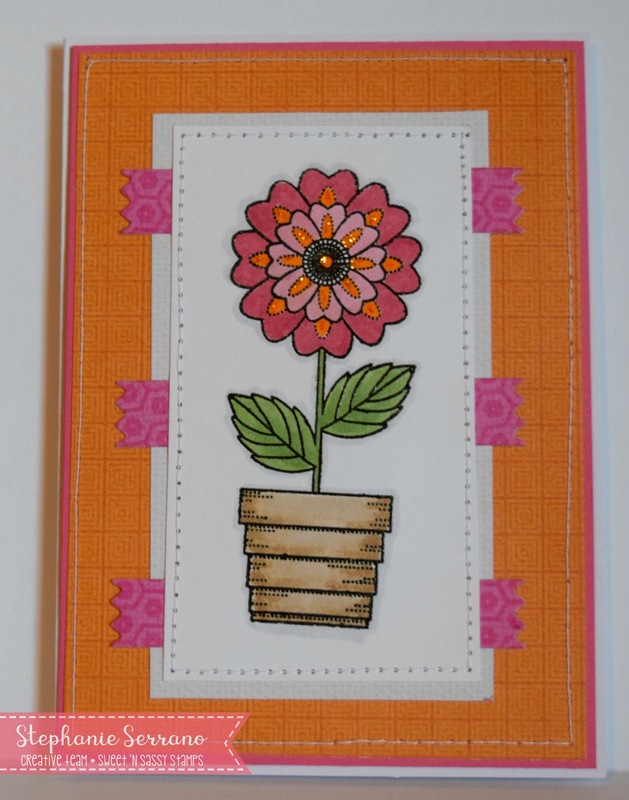 I also stamped the flowers on another piece of white cardstock and colored them. I then fussy cut them and adhere them on top of the previously stamped background, offsetting the flowers a bit to make them look fuller. I hope you enjoyed today's post! 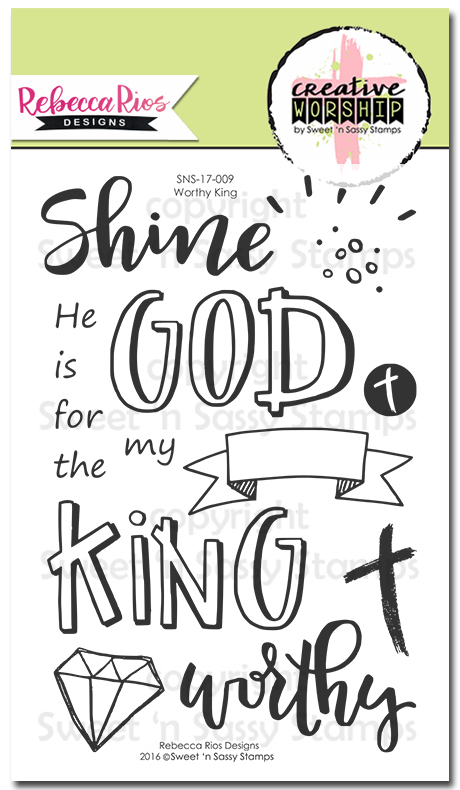 Make sure to take a minute and stop by the shop to take a closer look to this and other new stamps from our new release at Sweet 'n Sassy Stamps. Have a crafty, happy weekend! Happy Friday!! 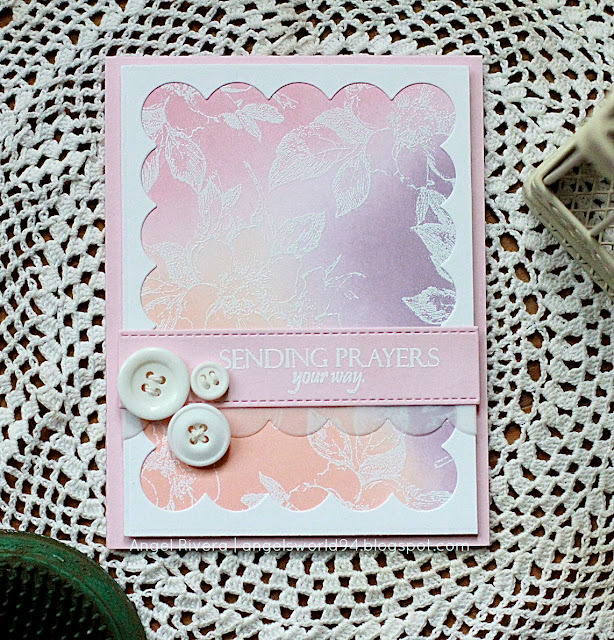 Today, I'm sharing a card that features two of Sweet 'N Sassy Stamps' new sets. I'm totally in love with the beautiful images in Krista Hamrick's illustrations. This most recent set, Living Word, is so inspiring! I combined the main image with Words of Life: Actions for this card of encouragement I'm sending to someone very special. Greetings! Kim here today to share a Bible journaling layout featuring the As the Deer stamp set. 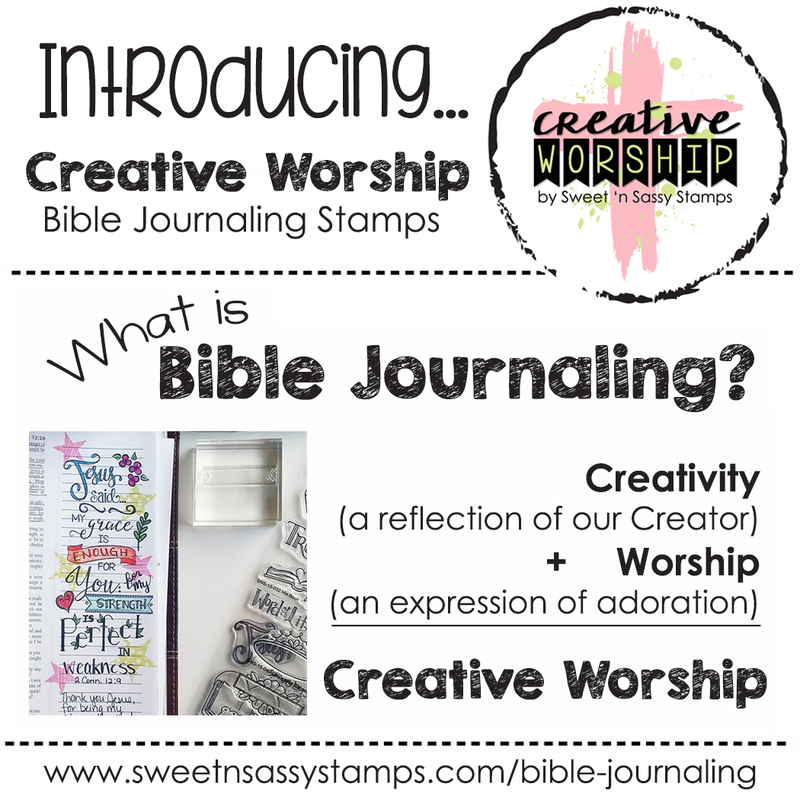 I am relatively new to Bible journaling and I confess that I love it! 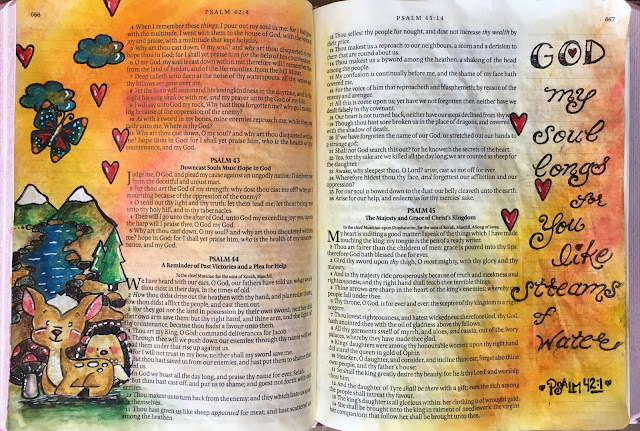 I purchased a Bible just for art journaling and its one that includes some pre-printed designs and Scripture verses that you can color or paint. I find this option can be a great source of inspiration. For today's layout, can I share that I love this set! It features so many sweet images that are perfect for creating scenes. This is a perfect set for creating cards as well...so many options! On my pages I used gelatos for the background color and Prismacolor Water Color pencils for all of the coloring. And...I created a video to take you through my creative process. Enjoy! Hello Sweet Friends! It's Monika here today with a sympathy card. 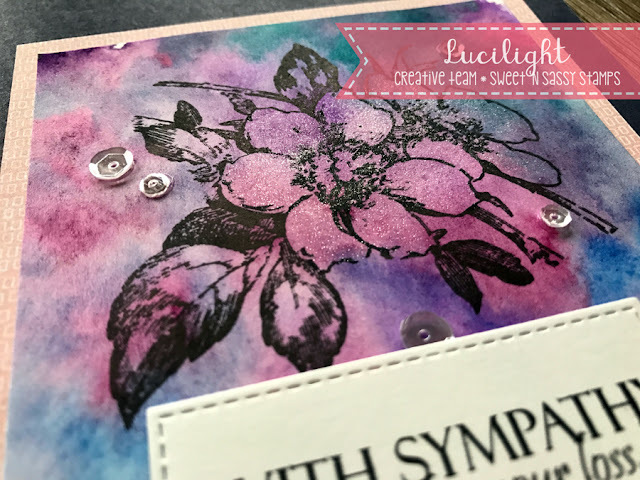 I love stamping and heat embossing on vellum, so when I saw the gorgeous flower images in the Floral Greetings clear stamp set, I new I had to make a card with vellum... it is a very easy technique, and looks fabulous. If you can fussy cut the images and used them as 'embellishments' they even look better! Such a delicate look, don't you think? I stamped (and heat embossed) the bigger flower again and after fussy cutting it, I adhered it on the base image with dimensional tape. I also stamped three butterflies... they look so wonderful fluttering around. The sketch for my card came from CAS(E) this Sketch #208. 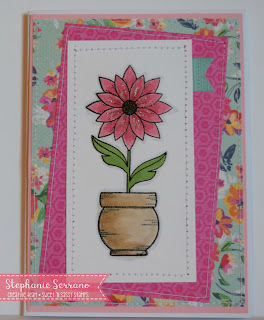 Today I am sharing a card using the new Floral Greetings stamp set in the Sweet 'n Sassy website. 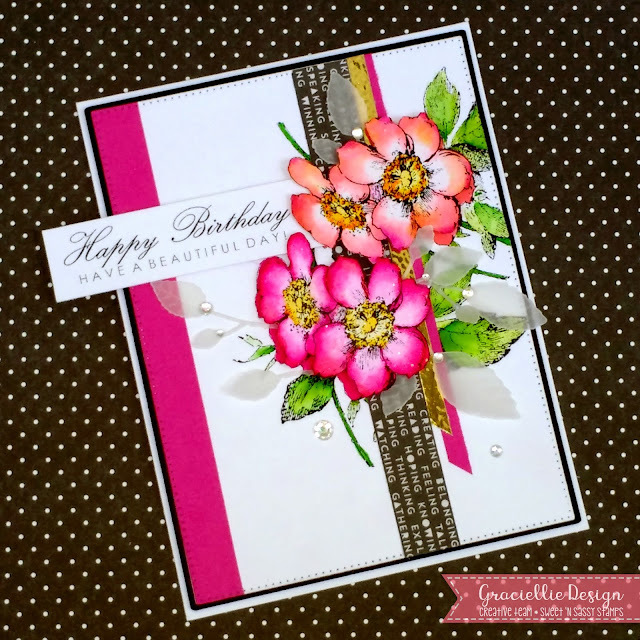 I originally started making this as a black, white, and gray card but decided to give it a pop of raspberry color. I'm glad I did! I colored with Copics and added some clear Wink of Stella to make the top butterfly and flower sparkle. One butterfly was fussy cut and attached near the diecut corner. Have a happy Saturday! 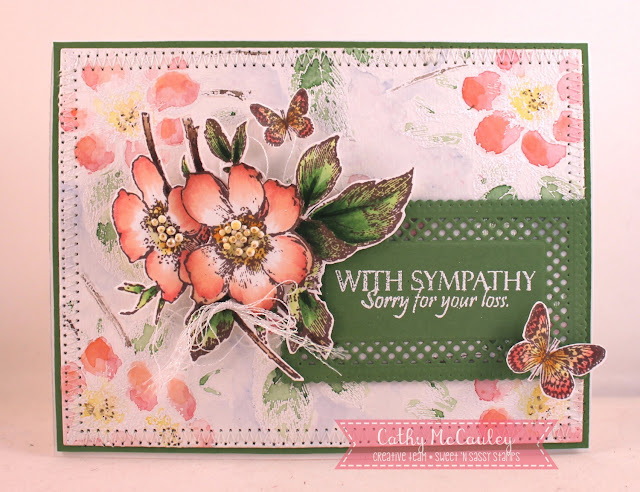 Thanks for popping in and… happy stamping! 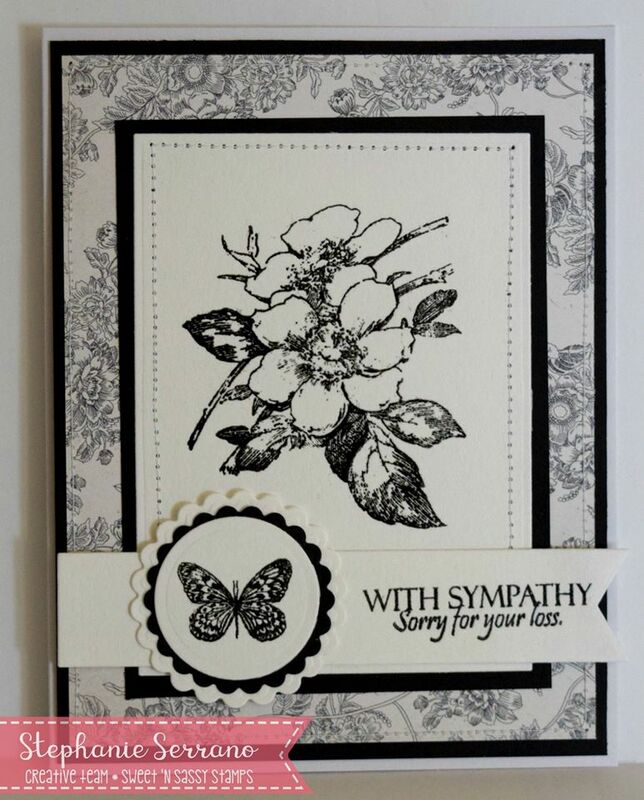 Hello friends, Stephanie here with a card I made using one of the new release sets called Floral Greetings by Graciela Chavez, I decided to go with a black in white theme, I think it looks so elegant! The background paper is by Authentique. Be on the lookout for more from the design team in the coming days, the new release is awesome! Hi there Sweet 'n Sassy Friends! 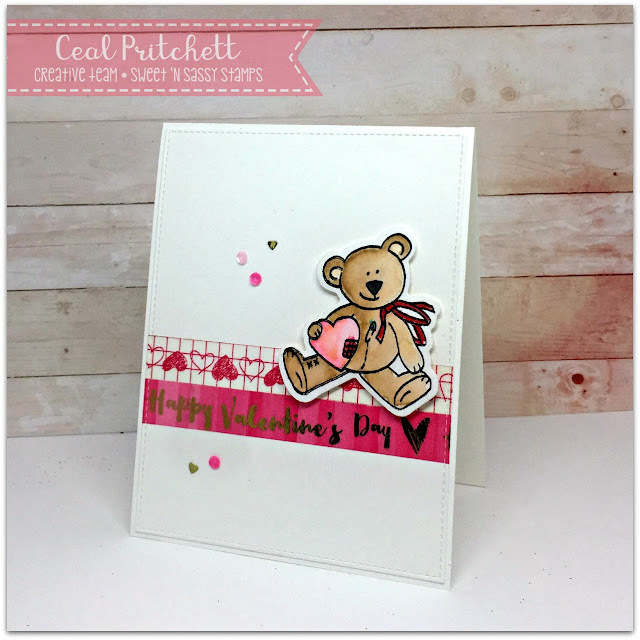 It's Ceal here to share a card using one of my favorite valentine sets, Valentine Critters. The images in this set are so adorable! To make my card I started with a white card base, a white panel cut down with a stitched die and a scrap of watercolor paper for the bear. I stamped the bear in waterproof ink and then colored it with Zig cleancolor pens. 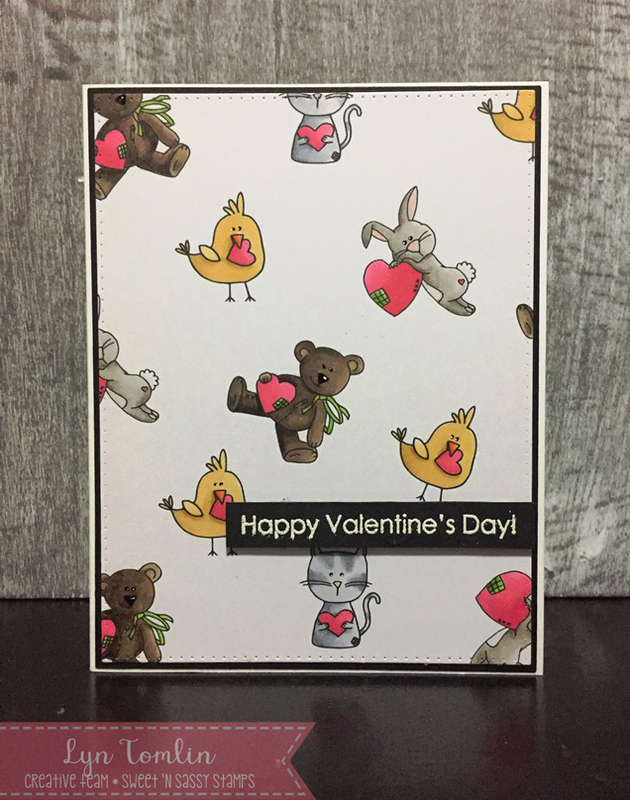 I cut him out with the coordinating Valentine Critters dies (discontinued). I added some washi tape to the front of the stitched panel and popped the teddy bear up using foam tape. To finish the card I added some sequins along with some tiny gold hearts. I have a fun background today (haha, I feel like I have been saying that a lot lately - YAY Me!!) - I have been wanting to do a background collage of images... so for this technique, I went with digis. The beauty of a digi is that you can change their size, in the case of this card, move them around on the paper as many times as you want before committing to the layout, and even flipping the image if you want. Pretty convenient for this type of project! It turned out sweet right? Now it is your turn - create a simple card with an image filled background. 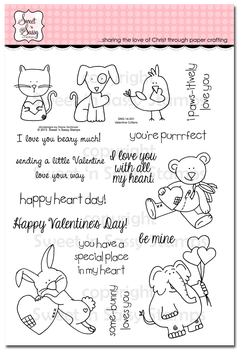 This works with clear/rubber stamps too! I can't wait to see what you create! Hi all! Angel here today with a card that features a peek at the stamp set Floral Greetings which will be available in the SNSS store this Friday! This is truly a beautiful set with the loveliest sentiments. I embossed one of the flowers in the set onto some white card stock, then sponged on three different inks to highlight the flowers. The sentiment, one of many in this set, is also embossed. It's Gracie Chavez from Graciellie Design and it's an honor to share on the Sweet 'n Sassy Stamps blog for the first time! 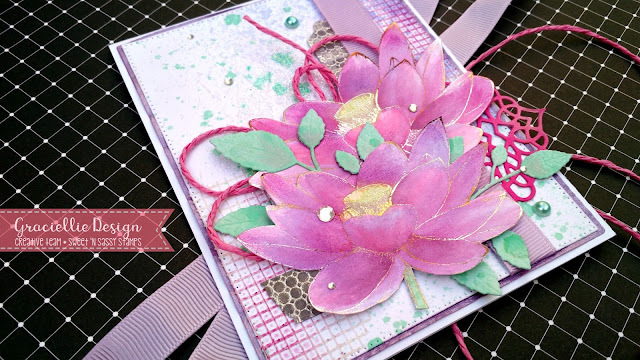 Today I bring you some mixed media inspiration using the beautiful Lotus Flower stamp. The Lotus Flower was actually digitally stamped. (It is also available as a clear stamp and is currently on SALE here!) I printed the image on a laser printer and foiled it using a laminator with a beautiful Amber Watercolor foil transfer sheet. Once the image is foiled it will allow you to play with resist techniques since it works just as an embossing powder would. I went ahead and painted the flowers with pigment inks, picking up the inks with a waterbrush. After the ink dried I added a few accents to the petals using pink tones of Pan Pastel, applying it directly with my fingers. To soften and add a subtle shimmer to the images I applied a tad bit of Metallic Silver Pan Pastel too. To make the flowers stand out I fussy cut them and adhered them to a very textured background. It may not show as much but there's a stenciled clear embossing paste pattern to which I added iredescent glitter behind the flowers. Additional texture on the corners of the card was created with drywall joint tape, which I also colored with some Pan Pastel. I added depth to the background with a few splashes of Ink Spray. Finishing touches include foil washi tape and rhinestones, a die cut piece, ribbon and paper twine! I hope you enjoyed today's post! This and many other sets including a background stamp I designed for Sweet 'n Sassy Stamps are on sale now (50% off)! Do stop by the shop and grab your favorites... Sale will be up while supplies last and these sets will be gone for good! Hi Sweet 'n Sassy Friends, Ever have a week that the days get away from you? 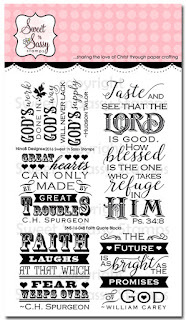 We have had a busy week, that has been filled with opportunities of personal growth and spiritual growth! 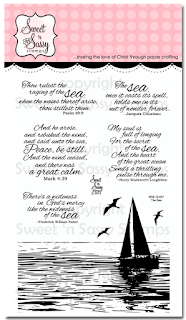 I have another card today using the beautiful The Sea Clear Stamp Set. You will love using this stamp set in your creations to encourage others. The Scripture and the poetic quotes that are in this set are the perfect words to encourage someone who is going through a challenging time. 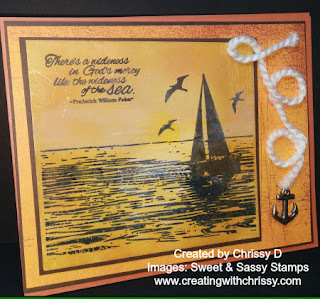 On my project to day, I stamped the Sailboat image using Staz-On Black ink on glossy cardstock. Using several different yellows and Jumbo Sponge Daubers, I added a golden hue to create a sunset landscape. I matted the glossy cardstock on a dark brown cardstock and then a piece of retired Basic Grey patterned paper. Repeating the layering on the dark brown and then an orange piece of cardstock for the base. Once I looked at the card, I realized I had too much yellow. So I added some white Sharpie, extra fine to the water reflections, to create more contrast. Once finished, I looked through my embellishments and added an anchor with a Mini glue dot, I took some chord and looped it to create a rope look and adhered it to the cardstock with liquid glue. I appreciate you taking a peek today. Come back tomorrow for some more eye candy created by Gracie.